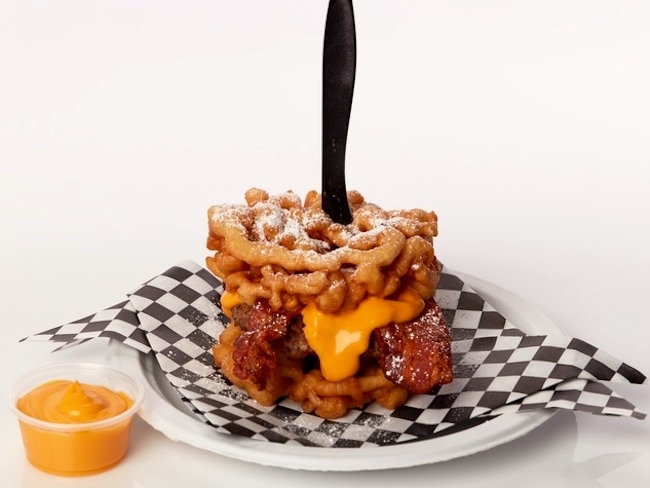 A combo of two fair favorites: funnel cake (deep-fried dough) and a bacon cheeseburger. Funnel cake … is a regional food popular in North America at carnivals, fairs, sporting events, and seaside resorts. 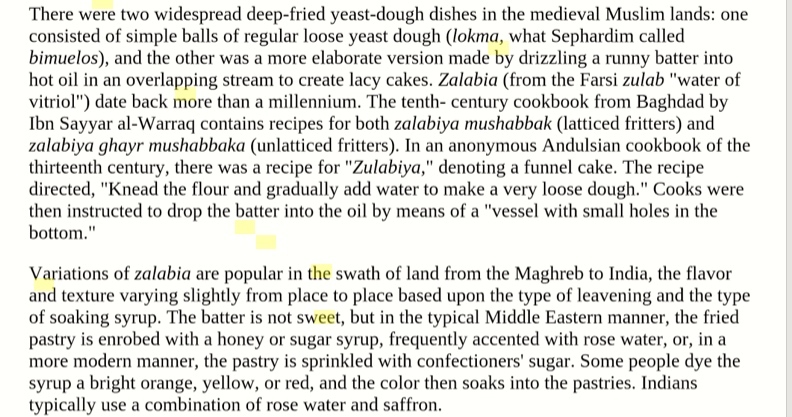 The concept of the funnel cake dates back to the early medieval Persian [and Muslim and Jewish] world [see below], where similar yeast-risen dishes were first prepared, and later spread to Europe. 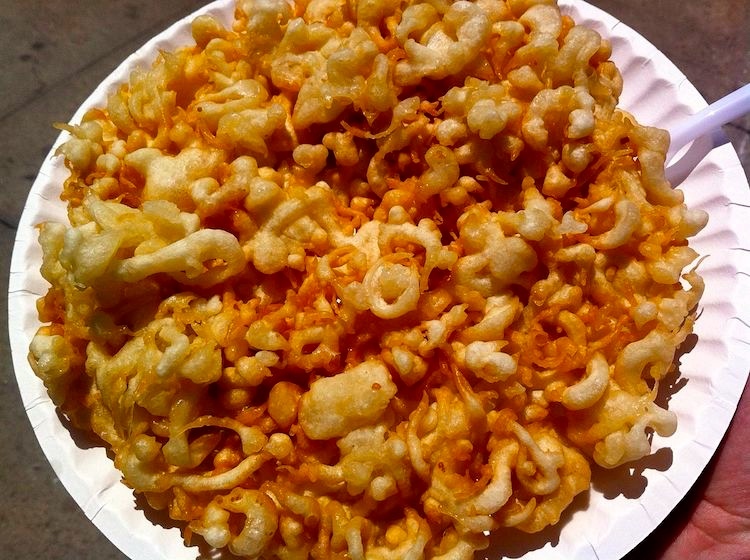 Pennsylvania German immigrants brought the yeast dish, known as Drechderkuche [or Drechterkuche; German / Dutch Trechter ‘funnel’], to America and around 1879 developed the baking powder version along with its new name, funnel cake. Funnel cakes are made by pouring batter into hot cooking oil in a circular pattern and deep frying the overlapping mass until golden-brown. The batter is commonly poured through a funnel creating its texture and giving its name. When made at concession stands, a pitcher with an integral funnel spout is employed. … Funnel cakes are typically served plain with powdered sugar, but can also be served with jam/jelly, cinnamon, chocolate, fresh fruit, or other toppings. The fried dough is shared throughout the crescent from northern India through Andalusia in Spain — a gigantic chain of complex cultural diffusion that, after the expulsion of the Moors and the Jews from Spain in 1492, ends up with the food among rural Christian folk of the German-speaking lands, who carried it with them to southeastern Pennsylvania and then on to other places in the New World. The only thing to do is to start with, say, 3 cups of the flour and keep on adding until the batter seems satisfactory. After that the frying becomes quite an art, because all sorts of shapes can be achieved by quick twists and turns of the funnel [also not mentioned, except in the name of the dish] and covering and uncovering the opening [note: not just any old funnel, but one with a lever for controlling the flow of fluid — called a piston funnel or confectionaryfunnel]. Serve at once, sprinkled with powdered sugar. 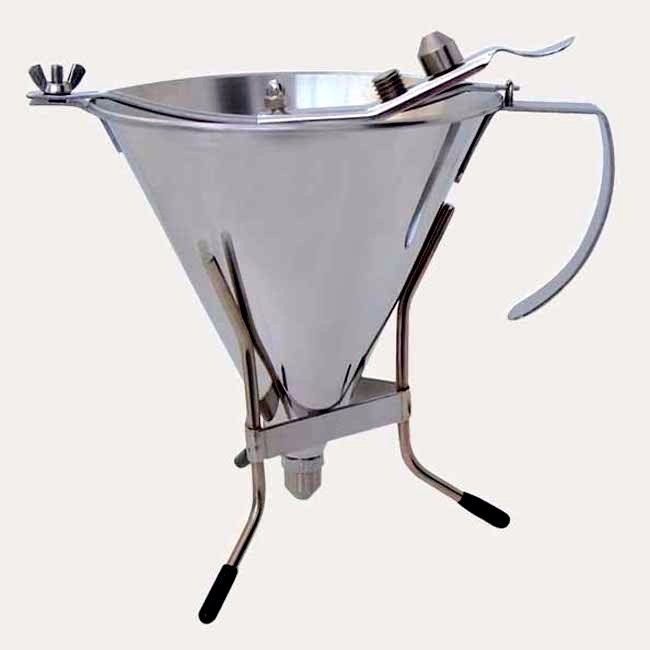 Kwik Pro piston funnel entirely of stainless steel, used for filling, dispensing, garnishing. Hutchison’s recipe doesn’t tell you how many people it is expected to serve (4, probably, if they’re modest eaters), nor does it explain that funnel cakes are traditionally a breakfast dish (zalabia is a sweet dessert for special occasions). Characteristically, the recipe is deceptively simple, but it’s also tricky — tricky enough that my Pa. Dutch grandmother (hereafter, Grandma Sue) never attempted to make it for the family — but then the family had 20th-century breakfasts, cereal from a box, eggs, toast, orange juice, that sort of thing. In any case, growing up in the mid-20th century in Pennsylvania Dutch country, I knew funnel cakes only as a food of fairs and carnivals, the occasional summer church festival (especially strawberry festivals, where you could get homemade strawberries in syrup, to drizzle on your funnel cakes), and amusement parks (notably Hershey Park, where the funnel cakes came with hot chocolate sauce drizzled on them). This entry was posted on September 1, 2017 at 2:27 pm and is filed under Language and food, Sociocultural conventions. You can follow any responses to this entry through the RSS 2.0 feed. You can leave a response, or trackback from your own site.